Sunday April 10 1910 I was busy with the work. I could not go to church I had little chickens hatching and I got dinner early so I went up to Homes with John & Hattie at 1.30. We spent a pleasant afternoon. When we got back at 6.12 Hattie stopped for supper. John went on to town. I did the evening work. A beautiful Day. 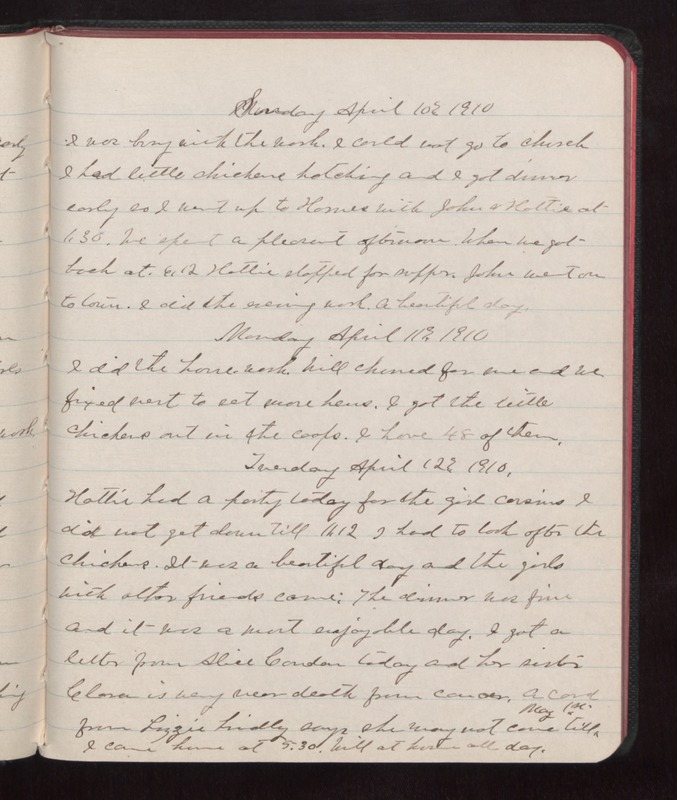 Monday April 11 1910 I did the house work. Will churned for me and we fixed nest to set more hens. I got the little chickens out in the coops. I have 48 of them. Tuesday April 12 1910. Hattie had a party today for the girl cousins & did not get down till 11.12 I had to look after the chickens. It was a beautiful day and the girls with other friends came; The dinner was fine and it was a most enjoyable day. I got a letter from Alice Condon today and her sister Clara is very near death from cancer. A card from Lizzie Lindley says she may not come till May 1st I came home at 5.30. Will at home all day.